Halloween is no longer a one-night event that occurs on the last evening of October. It now seems to last all of October with the grand finale happening on October 31. The list of possible things to do in LA in the month leading up to the big night is endless. There are all sorts of possibilities for all ages, such as Halloween-themed events at theme parks, zoos, aquariums, and museums; haunted houses; carnivals and festivals; pumpkin patches, just to name a few. But with full days of school and sports on the weekends, I find it’s hard to find time to do much of it! We still managed to do a few special things this year, though nothing too out of the ordinary.To mark the Halloween season this year, my kids have gone costume shopping (no more just buying something they want online, they want to see all the choices), decorated the exterior of our house, visited a pumpkin patch, attended a Halloween party, participated in a school Halloween parade and carnival, carved a pumpkin, and of course gone trick-or-treating. 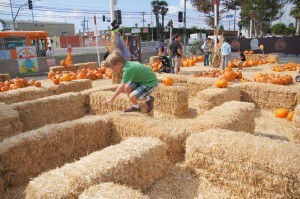 This year we visited Shawn’s Pumpkin Patch in Culver City. Despite being among the older kids on the grounds, my kids had a good time. 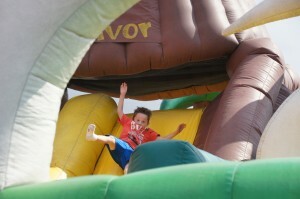 Most popular was the huge bouncy they had, and my kids insisted on climbing through it multiple times. There was also a petting zoo, pony rides, a little train circling the grounds, and arts and crafts activities, but they expressed absolutely no interest in those. Also enjoyed by my sons was a small, low hay maze most likely intended for much younger kids, but my kids made it work for them by racing on the tops of the hay bales and jumping from one bale to another. Then of course there were the pumpkins, which was really the main reason for our visit. Doobie needed to bring a small one to school for Pumpkin Day. 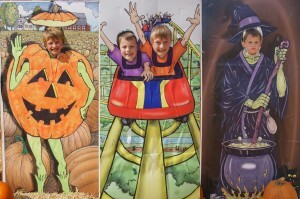 We wrapped up our visit to the pumpkin patch with several pictures of the kids in the Halloween themed cut-outs. It was fun to see my kids get so much enjoyment from something intended for younger kids, but I think we’ve now outgrown the parking lot variety of pumpkin patches. Next year, we need to make an effort to head out of town to a more authentic pumpkin patch, like the one at Underwood Family Farms. We’ve actually been there before when the kids were much younger and even last year on a school field trip. There is a corn maze, a huge hay pyramid, tractor-drawn wagon rides through the fields, live farm animals, play areas, and lots of wonderful picture opportunities, without city traffic in the background or the need for cut-outs. We’ve never been there on a weekend, and I think they add some extra fun and entertainment then. Of course, the highlight of the kids’ Halloween season was trick-or-treating. A friend and his dad joined us for a simple dinner beforehand and then the dads headed out with the kids. I stayed home to give out candy. 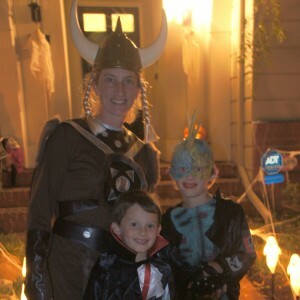 I was a little nervous about what to expect since I had recently learned that our neighborhood was on several lists as one of the best places to trick-or-treat in LA. I was actually a bit surprised by that since I know Beverly Hills is usually popular and then there’s 16th Street in Santa Monica where we were last year which was crazy (lines to walk along sidewalks and get into houses and even a police presence in the area), and neither of those places were on the lists. I bought more candy than I did last year just to be on the safe side. We actually ended up with about 234 people at our door between 6:15 and 9:15pm. That was about twice as many as last year. I didn’t have as much candy left as I thought I might, which in a way is good. The kids wandered the neighborhood for two hours and came back with buckets full of candy. They were satisfied. 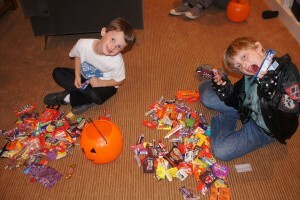 Before they began to sort through their loot, they wanted to hand out candy to trick-or-treaters who were still coming. I happily accepted the help since I had been back and forth to the door for over two hours. Once it started getting slow at 9 o’clock, they delved into their candy and began sorting and tasting. At 10 o’clock they were finally in bed, and I was dreading the next morning when I would need to wake them at 6:45 for school. On my list for next year’s Halloween season is of course a visit to a bigger and more interesting pumpkin patch. It would also be fun to try Legoland’s Brick-or-Treat Trail and the Spider Pavilion at the Natural History Museum. I hear Disneyland’s Halloween Time is also worth a visit. The possibilities are endless; too bad our time isn’t! 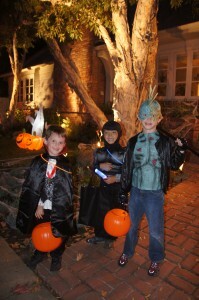 This entry was posted in Los Angeles & Environs and tagged Halloween by Patricia Zanuck. Bookmark the permalink.